Brain extraction is an important step in the analysis of brain images. The variability in brain morphology and the difference in intensity characteristics due to imaging sequences make the development of a general purpose brain extraction algorithm challenging. To address this issue, we propose a new robust method (BEaST) dedicated to produce consistent and accurate brain extraction. This method is based on nonlocal segmentation embedded in a multi-resolution framework. 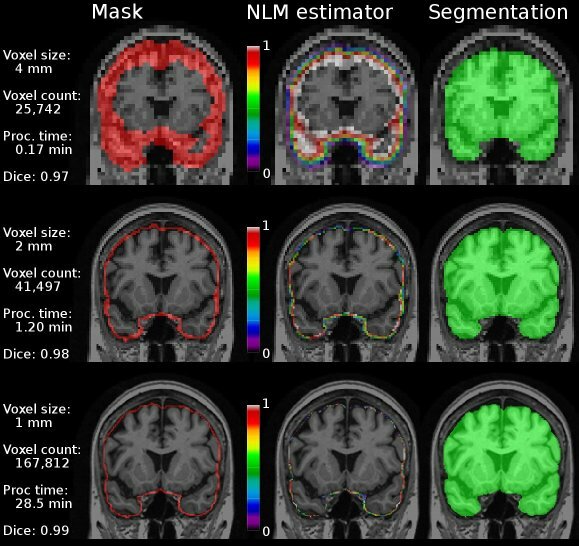 A library of 80 priors is semi-automatically constructed from the NIH-sponsored MRI study of normal brain development, the International Consortium for Brain Mapping, and the Alzheimer’s Disease Neuroimaging Initiative databases. In testing, a mean Dice similarity coefficient of 0.9834±0.0053 was obtained when performing leave-one-out cross validation selecting only 20 priors from the library. Validation using the online Segmentation Validation Engine resulted in a top ranking position with a mean Dice coefficient of 0.9781±0.0047. Robustness of BEaST is demonstrated on all baseline ADNI data, resulting in a very low failure rate. The segmentation accuracy of the method is better than two widely used publicly available methods and recent state-of-the-art hybrid approaches. BEaST provides results comparable to a recent label fusion approach, while being 40 times faster and requiring a much smaller library of priors. Simon Fristed Eskildsen, Pierrick Coupé, Vladimir Fonov, José V. Manjón, Kelvin K. Leung, Nicolas Guizard, Shafik N. Wassef, Lasse Riis Østergaard and D. Louis Collins: “BEaST: Brain extraction based on nonlocal segmentation technique”, NeuroImage, Volume 59, Issue 3, pp. 2362–2373. The following releases has been tested under Debian style Linux distributions, such as Ubuntu. See README.library on how to include ADNI images/masks in the library.